Dawn and I are so thankful that soon we will have our third child. 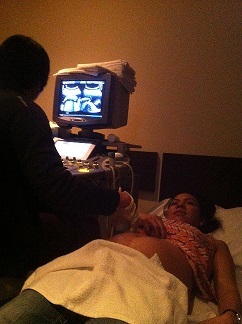 Dawn inside the clinic for an ultrasound. We’re hoping that it’s a girl this time since we have two boys already. Paulo and Carson. Of course, whatever God will give us we will accept it wholeheartedly. Last week’s ultrasound showed it’s a girl though we will never really know until it’s born. As always, we would like you to celebrate with us for this AMAZING blessing. Get this new course now and take advantage of early bird discount and get $10 off the original price. Right click on the link below and then click “Save Us”. Simply print this document, post it to your wall and meditate it as soon as you woke up and before you go to bed. You’ll need adobe acrobat reader to open the file. Two weeks ago I was watching a movie with a very interesting scenes at the beginning. The first scene was this lady (the lead role) visited her doctor. The doctor checked her up and told her that she has a cancer. If you have 1 month to live, what are you going to do? Think about it for a couple of minutes before you continue reading this email. So what comes to your mind immediately? To some people maybe they’ll share their faith to unbelieving love ones or friends. Or simply, they’ll spend more time with people they love the most. The reason I’m asking you these questions is, I was reminded by a scripture when I was watching this movie. You see, life can be overwhelming sometimes with lots of to dos at work, church, home, etc. But you need to know your priorities in life and treat is for what it is … a priority. If it’s your family then spend time with them, hug them, love them, or forgive them. Also, do whatever your heart is telling you what to do.